We use Australia Post for all deliveries within Australia. Australia Post deliver during normal business hours. If you are not at home when the goods are delivered, Australia Post will leave a card informing you of how to collect your goods at a specified location during normal business hours or to arrange a suitable re-delivery time. If products are in stock they will normally be despatched within 3 working days of accepting your order and after despatch should arrive within 2 – 10 business days depending on your location. International orders may be subject to local tax, charges and customs duties. Any such costs and associated fees, if applicable, will be charged once the goods reaches its destination country. These charges must be paid by the recipient of the goods. We have no control over these charges and cannot predict what they will be. If you refuse to pay these charges your parcel may be abandoned and we cannot be held responsible for any loss of funds as a result of this occurrence. 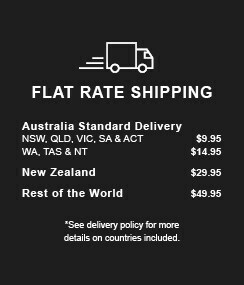 The product prices quoted on our website are the same for both Australian and overseas customers. We do not adjust the prices for GST and you are responsible for any local tax, charges or custom duties.